When I was in trip-planning mode, everywhere I looked recommended horse-riding. Pure bred, Viking horses exclusive to Iceland – gentle temperament, small, smooth gait, easy to ride, that sounded good. Then they described exploring the lava fields and natural wonders on horseback. That sounded perfect. I found a company called Ishetar which seemed to have a great reputation and promptly booked a half hour horse trekking family adventure (a taster session). Between the 3 of us, our horsey experience amounted to next to nothing – one (unsuccessful) trek for me 20 years ago and the 9 year old was on a donkey at the seaside twice. Still, no matter, I thought, we will love it. The horse riding centre was about ten minutes drive from Reykjavik, easy to find and a beautiful location. We arrived in plenty of time for our session and duly completed all the disclaimer forms, promising not to sue if we died. The weather was completely terrible. Gale force winds howled, bushes were bent in half and the rain lashed down. We drank copious amounts of the free coffee available and waited. They played a safety video about the session – nerves started to creep in. They stressed all the things you should not do – press your legs too hard into the horse (what is too hard?) and a lot of other things besides. The video showed the horse taking off like an out of control racehorse, dragging the poor novice rider along the ground if they did any of these things. I wondered what we were letting ourselves in for. The 9 year old had turned a deathly shade of pale. Nowhere on the video did it say this would be fun or easy. We were told the weather conditions were not safe for riding, the session would probably have to be cancelled. Big sighs of relief all round. Then, 5 minutes later, they said it was fine and it was going ahead. No evident wind and rain improvements that we could see. We got kitted out in riding hats, gloves etc. then were taken out to the stables. We were each “given” a horse and told to lead it out to the paddock. A bit unnerving to say the least – I led my very reluctant horse outside. A lady helped shove me into the saddle (not a pretty sight) and I was on horseback. Husband came next and had a similar experience, then the 9 year old with his (huge) horse. After a huge struggle to clamber on, he looked mighty uncomfortable, awkward and very reluctant. By this point the wind was roaring and the rain was beating into us. We were just about to set off for the “fun” family adventure, when the 9 year old announced in no uncertain terms that he was not going. He promptly dismounted, gave the reins to an instructor and headed off inside. I followed – what else could I do? (relief, gratitude and lots of other such feelings). Husband, having made such an effort to get into the saddle stayed put and did the ride. We sat in the waiting area, warm and dry until he came back. He enjoyed it, but does not mind if I never book another horse trekking family adventure ever again. Afterwards we drove into the nearby town of Hafnarfjordur – a little coastal place famous for housing Iceland’s largest colony of elves and hidden folk. 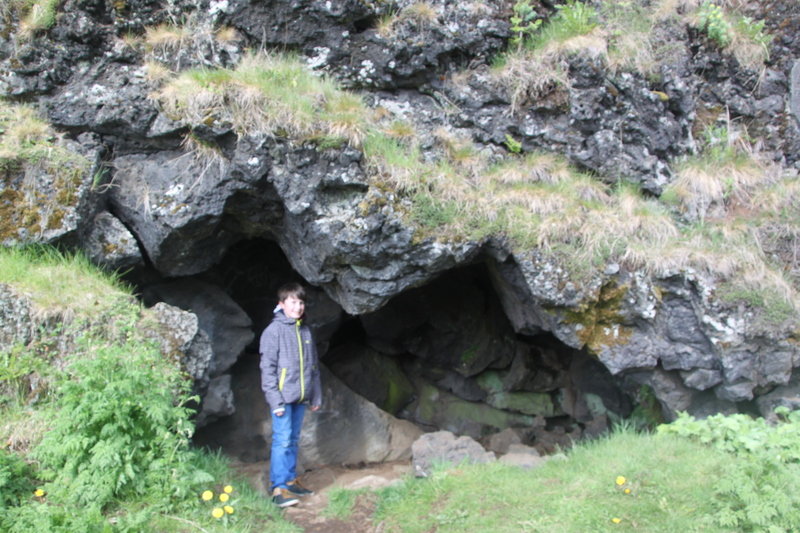 The Icelanders say lines of mystical energy converge here, hence the elves. The 9 year old wanted to have a look, so we humoured him. 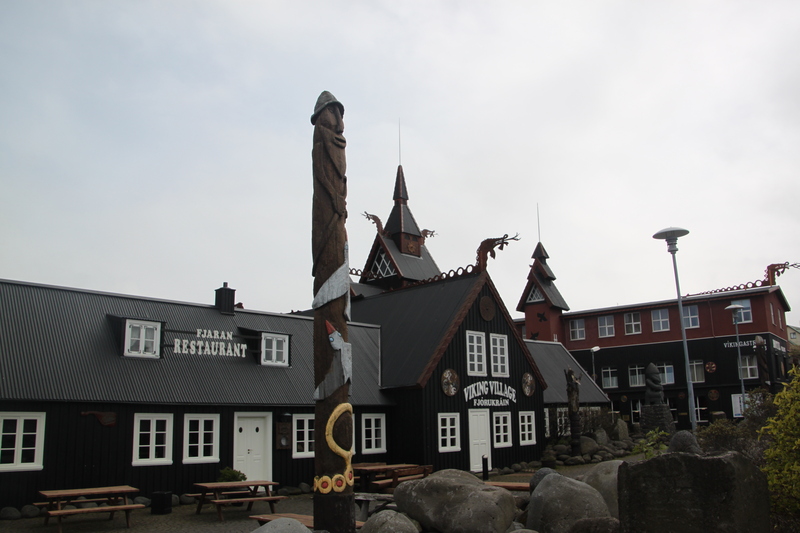 We found a hotel called the Viking Village – very gimmicky and themed with all things Viking. 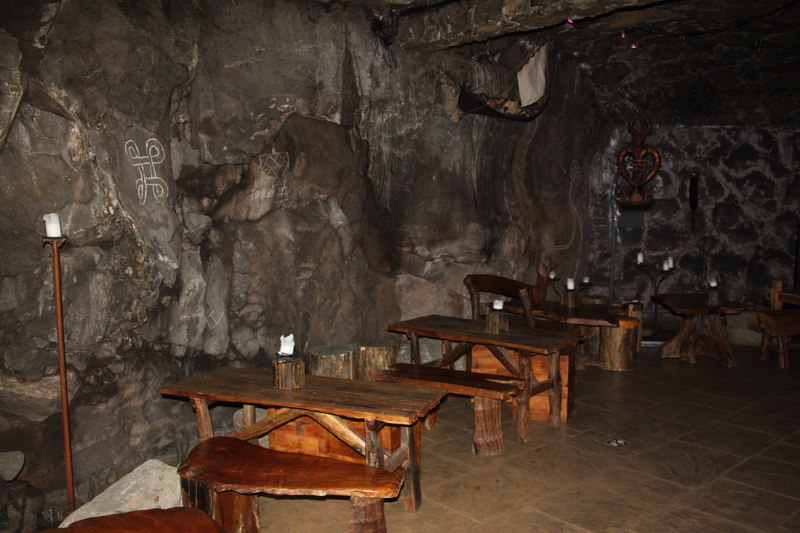 It was deserted, but we had a quick look in the restaurant. 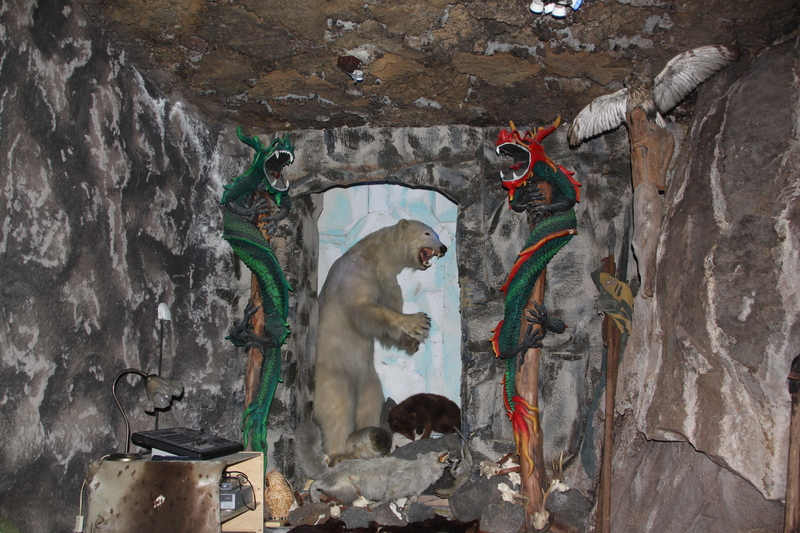 It looked a bit sad and over-themed – maybe things improve when they have the Viking festival here. 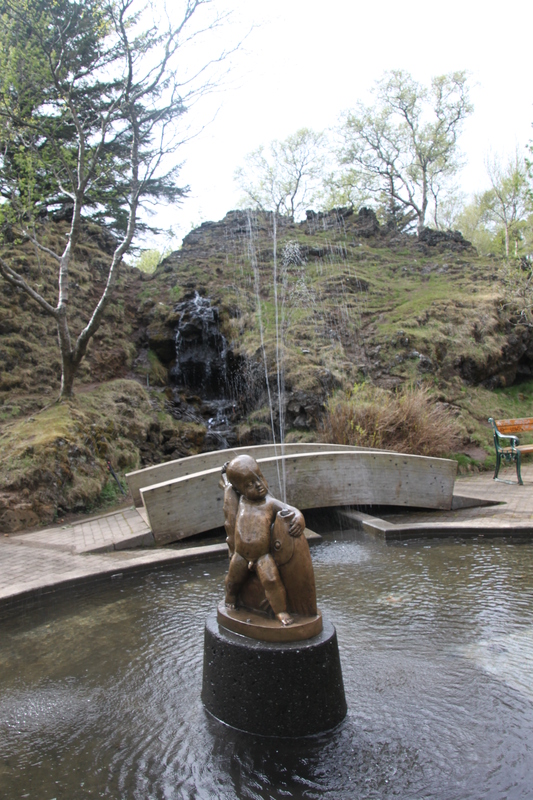 A walk around a lava park in the town called Hellisgeroi Park was next. You can book an elf tour here and see sights of elf interest. We took the self guided option, maybe that was a mistake. We saw some little statues and a path but nothing worthy of note, and nothing elf-like. To say we were underwhelmed by Hafnarfjordur was a bit of an understatement. Back in Reykjavik, we decided to be more adventurous tonight with our choice of evening dish – husband wanted to eat a puffin, I fancied minke whale. We fed the 9 year old pizza beforehand, then set off with a restaurant in mind. It was full, as were several other places we tried. Despairingly (and very hungrily) we almost gave up and headed for a pizzeria. 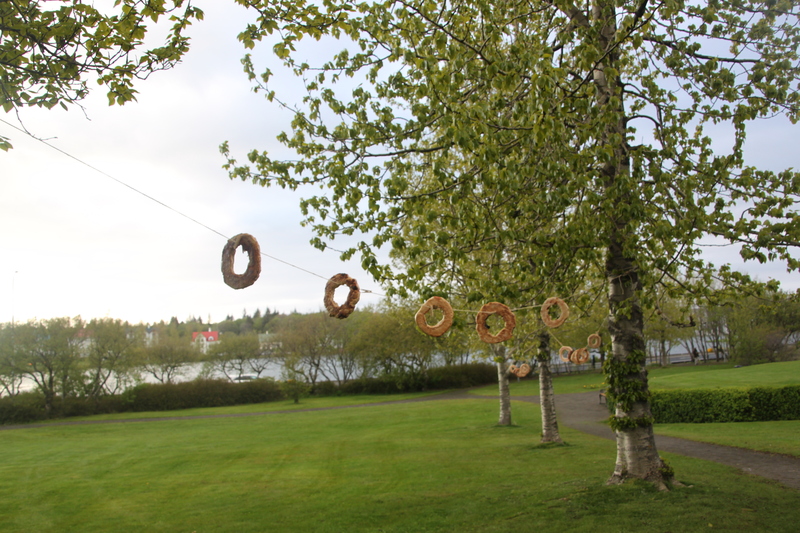 We needed food so badly, even these bagels left for the birds started to look appealing. 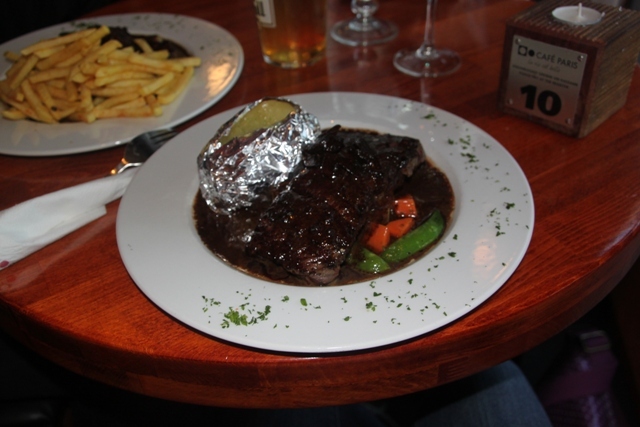 Eventually we found a place near the harbour, which had a table free and served minke whale (no puffin tonight). It was very touristy, not really our preferred option, but beggars can’t be choosers and we went for it. The whale was unusual to say the least – the texture was not unlike steak, the flavour a bit like beef that had been dipped in seawater. Rather strange, but not altogether unpleasant. It turned into a beautiful, bright evening – our second to last in the city. As we strolled through the streets we were amazed at how lively the city was tonight. People were heading out with partying in mind – Thursday night and they all seemed to be gearing up for the weekend. Those were the days. This post had me laughing out loud! I have ridden since I was a child – someone should have assured you that trekking horses are very used to beginners and are almost all sweet tempered and calm. The weather…well, that’s a different matter entirely! Regardless, you had me crying with laughter at “husband wanted to eat a puffin. I fancied whale”. Great writing! As you can tell we are not horsey people – even the sweet natured ones freaked us right out!! Add that to the weather and I don’t know what I was thinking of…. still it made a good story!